With terrible timing, this week we have, as well as catching up on all the digging, and sowing and starting the planting out, been butchering a mutton. Well, that was Wednesday – and no we would not have planned it had we known it would turn hot – but I distinctly remember the news stating the cold weather would continue until June – and it was definitely cold last week! Still, fortunately our house is cave like and perma cold, and even a big sheep carcass is a relatively fast job to butcher – we kept everything we were not working on in the freezers chilling down as we went. 10 roasting joints – that is 4 legs, 2 chumps, 2 loins and 2 racks. We did the mincing and burger making the next day, having let the trimmed meat chill down to almost frozen, and worked in the cooler evening, yes once again making burgers at midnight! I’m glad we live in a detached house, as the drone of the faithful old 1960s kenwood chef mincer, a good old workhorse plodding its way through the mountain of mutton might have annoyed the neighbours. I am, as always, sad to see one of the sheep go, but it was always going to be so, and I do firmly believe in what we are doing, particularly when it comes to grass fed animals. I also believe in nose to tail eating, but do make the allowance for not blocking my arteries with the fat, so excess lard is removed. We have previously made soap from mutton fat, but pig lard soap is much much better. And both better than palm oil! This morning though, as it rained, we slept in.. a lovely long lie in. Accompanied by the sound of summer rain. The day brightened, the digging was finally finished, plants going in, the sun came out and we cooked over charcoal again for tea, before more planting. Nine pm, and I have finished watering and it might be time to rediscover what the living room looks like.. as it has been a while. 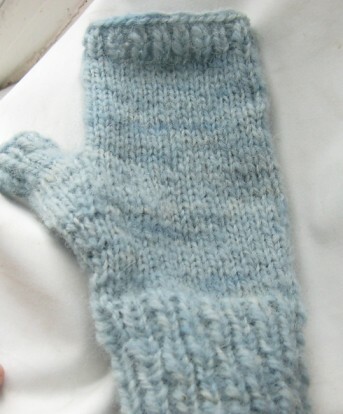 A hat and mitts for my son. Our own wool for the mitts, stash for the hat. He has taken up walking in a serious way. He has the boots, the stick, the waterproof coat, the companion, and now the cold weather gear. He can stop borrowing mine now. miles… zero 🙂 I like the way the blue shades show. 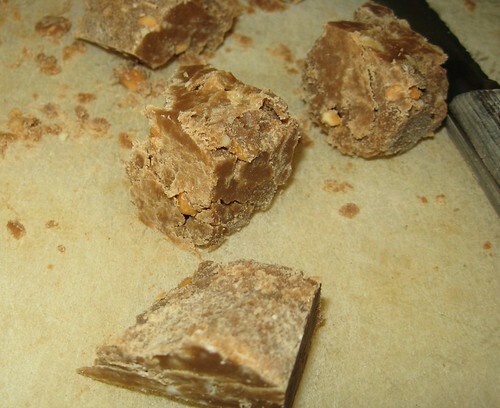 macaroons, thanks to Delia, fudge (what’s not to like about fudge, and the simplest of ingredients) ginger and brandy truffles and peanut butter fudge. yarn last Christmas in my stocking, its from Lang, and is cotton. I was at a total loss as to what to do with just 50g of the stuff.. knowing it was pricey and indulgent, yet being cotton not good for felting etc. 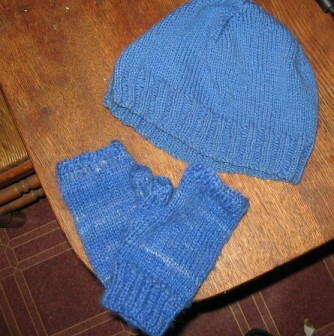 I spent a full year not doing anything, until, rummaging for stash to make a hasty hat for my son, I came across it again, and realised doing nothing was worst of all. 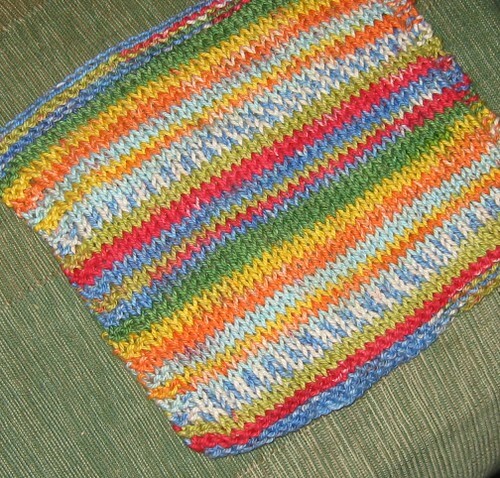 So I made this face cloth. And it was just perfect in the post turkey lunch, sitting by the fire, nursing an almost cold, to knit something without instruction or plans, and watch the pattern unfold. I shall enjoy using it, along with the yule scented soap we made from pigs lard just before thingymas. Whilst it was raining, we decided to have our first go at making soap. We have been rendering mutton fat on the rayburn over the winter, and built up a stash in the freezer.. and now anxious about freezer space, it is time to use it. We followed the hot process instructions in this great article on downsizer, and this lye calculator, and the results are really pleasing. We didn’t realise how fast it was coming along and had to move fast at the end to get it into the mould (a washed out juice carton ). We did render the fat at least 4 times, each batch, as I have heard that it can keep a mutton smell, but it seems to be gone. We added lemon essential oil – but not enough it seems as there is only the hint of lemon – but pleasing enough the background soap smell is nice – like a pure unscented commercial soap. We were so pleased with how easy it was and the results – definitely have the bug now (add that to the list..) and have lots of ideas for future batches of soap. Next we shall try the cold process – less energy, more time. Ultimately, I want to make my own lye too, which can be done using wood ash, and make a soap completely from our smallholding. Just as well we have plenty of mutton and pig fat to work our way through. 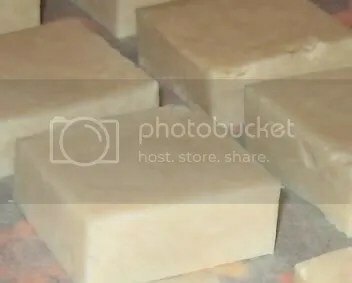 I had thought this would make a rough cheap soap – perhaps only good for laundry, but its’s better than that, perfectly nice for use on our own skin (the advantage of hot process is instant results!) . The animal fat wasn’t wasted, no palm oil here, very few “soap miles” !